This is an experiment to show the benefits of Grounding a living organism. The results were absolutely amazing and the photos below speak for themselves! Three identical conductive metal bowls were placed on top of a properly connected Earthing mat, each with a bunch of West Indian Jasmine flowers from the same bush, with an equal amount of water. From left to right: The first bunch of flowers is insulated using a plastic container lid, which stops the flow of electrons from the Earthing mat. The second bunch of flowers is placed directly on the Earthing mat, which allows the flow of electrons. The third bunch of flowers is placed on a Grounding Flip-Flop which is placed on top of the Earthing mat. 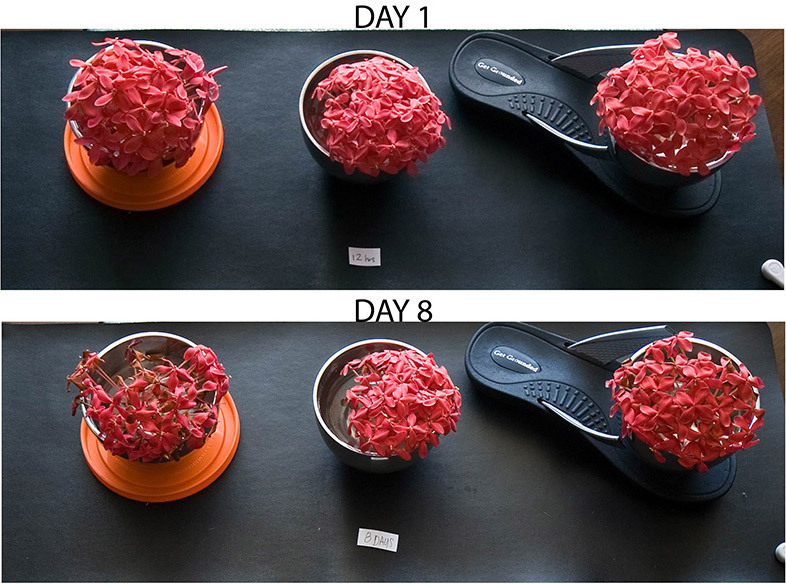 Each of the flowers was left untouched for 8 days in normal sunlight, with no added water or interference. You can clearly see the benefits of being grounded, either directly or indirectly via conductive footwear – the insulated bunch of flowers wilted much quicker than the grounded bunches of flowers.